I gotta be honest, I was one of the minority on the side of really wanting a downtown arena in Kalamazoo. 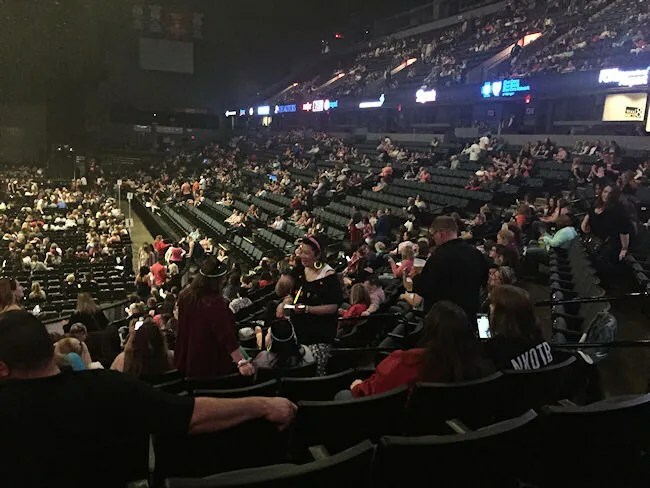 I enjoy going to Wings Event Center for hockey games, but I’d love to see more and bigger name concerts roll through town. I know what you’re thinking, “But all the good concerts would still go to Grand Rapids.” Well…..maybe, maybe not. You see, J and I met about ten years ago in Peoria, IL. There’s a great arena in downtown known as the Peoria Civic Center. They get great shows. I saw a lot of big name acts in that building during my five year stay in the Heart of Illinois. During the time I was there, a city about an hour to the southeast built their own arena. Bloomington, IL officially opened US Cellular Coliseum in 2006. There were a lot of acts that started picking Bloomington over Peoria. It was newer, had better facilities backstage, and was more intimate. We didn’t see a lot there before we moved to Michigan, but I still see friends going to shows there all the time. My only point in bringing this up, it sure would be nice to drive five minutes to see a show instead of 50. Still, if we have to travel 50, Van Andel Arena isn’t bad place to drive to. J and I haven’t been to a concert in quite a while. I actually can’t tell you what the last one we saw was. It may have been John Mayer, also at Van Andel several years ago before the kids were born. 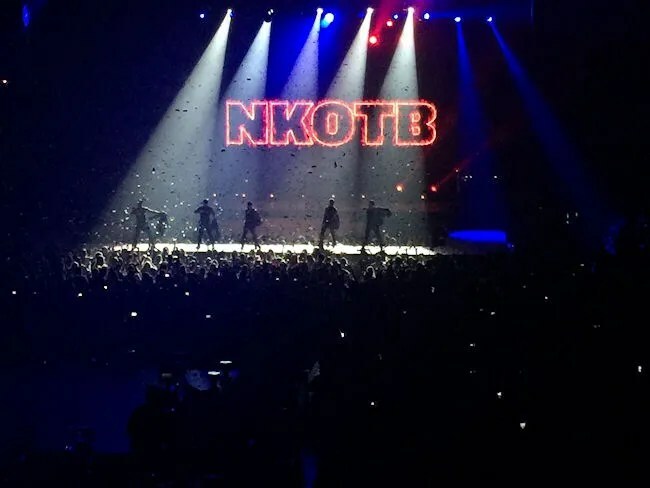 Last December, J made a comment in passing that she would like to go to the NKOTB concert in Grand Rapids. My parents were still looking for a Christmas gift for her so I mentioned it. Lo and behold, she got the tickets for Christmas and they offered to babysit so we could head to Grand Rapids for a night to relive our teenage years. 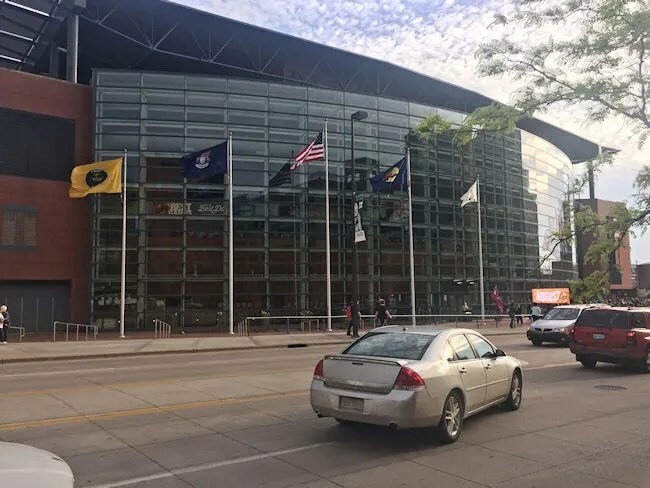 Van Andel Arena is right in the heart of downtown Grand Rapids on Fulton Street between Ionia and Ottawa Avenues. The arena opened in 1996 and is the home of the Grand Rapids Griffins, the AHL affiliate of the Detroit Red Wings. 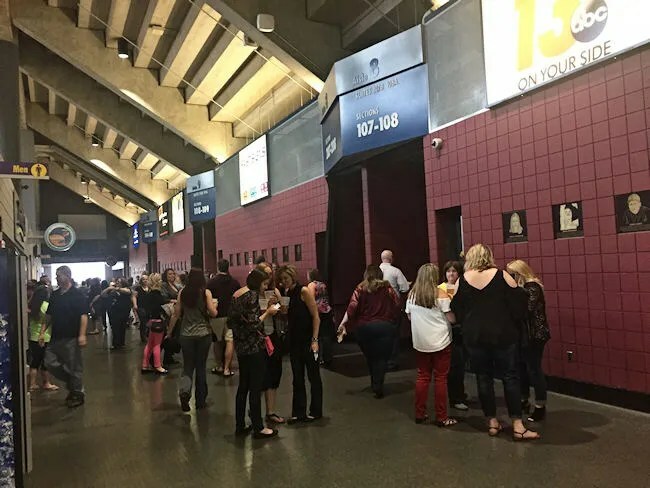 I’ve been to Van Andel many times for work and J and I have seen a few shows there as well including Taylor Swift right before she hit it big and John Mayer. We decided to make a date night out of the occasion and started with dinner at Vander Mill Cidery & Restaurant. We made it to downtown a little before 7:00 and started looking for a spot to park. I’m pretty familiar with downtown Grand Rapids, so when I noticed there were a lot of events happening and ramps were looking for, I headed to a surface lot a few blocks away over by the Civic Theatre. It was easy to get in to and would be easy to get out of after the show was over. As we headed back towards the arena, we noticed a really long line outside. That’s when I noticed the MAGS were actually outside on the large concrete area in front of the stadium instead of right inside the door where they used to be. The lines were actually moving pretty quick. J and I got through security and headed inside the lobby. The ticket takers are not right inside the door. There’s actually a small lobby area and that’s where the box office is. Will Call is inside after the MAGS so you don’t actually have to have ticket in hand to get in the building, but you won’t get very far if you don’t have. The ticket takers are right in front of the large staircase that leads up to the main concourse. The floor is at street level so in order to get up to the seating bowl, you have to climb the stairs. There are no escalators, but there is an elevator for those that can’t do the stairs. If your tickets are on the floor, you can actually get through without having to go all the way up. We headed up and our section was right at the top of the stairs. We both needed to find a bathroom first and get something to drink before heading to our seats for the night. Van Andel Arena plays like a huge arena, but the concourse area is actually pretty small. The arena is set up in a U-shape, so the concourse doesn’t go all the way around. There’s also no second level to go up to. 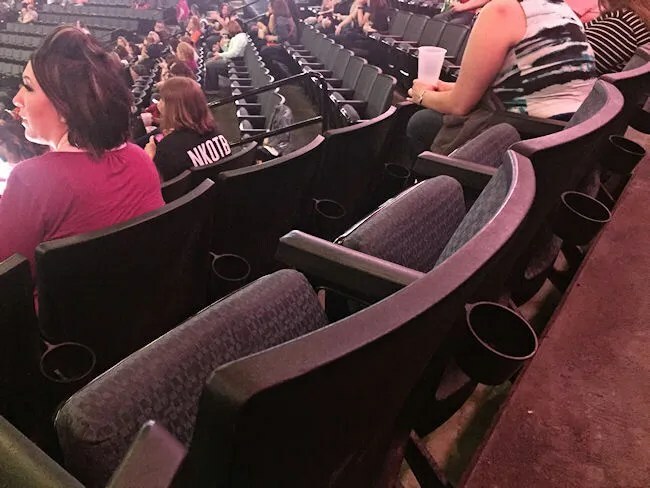 Both the 100 and 200 levels access the seats from the same level. When you go through the curtain to get in to the bowl, you go down if you have a 100 level ticket or up if you have a 200 level. There are a number of luxury boxes that ring the arena on the concourse level between the 100 and 200 level sections. The concession stands are set up like they are at most arenas. 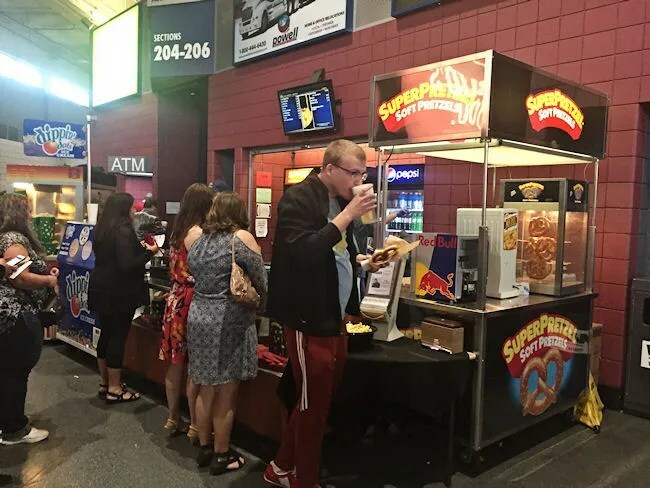 There are the traditional stands that are set into the walls and offer all the basics like beer, pop, hot dogs, and nachos as well as a couple specialty stands offering pizza and chicken wings. 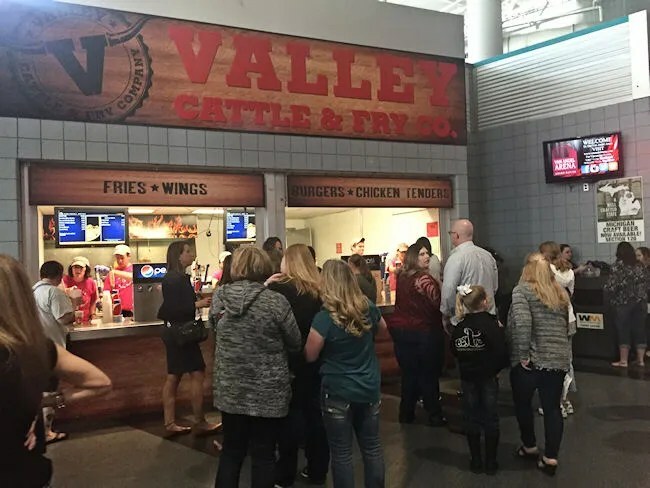 On the other side of the concourse, the wall that backs up to seating bowl, there are the quicker stands that are serving only beer or only mixed drinks or only snacks. The thing we found out for this show is everything had to be in a cup. No bottles or cans were allowed in the bowl, so even though I bought J a bottle of water, they had to pour it in to a plastic cup which is kind of annoying, but probably a good idea for the artists. Of course the beer was flowing for a concert as it usually does. 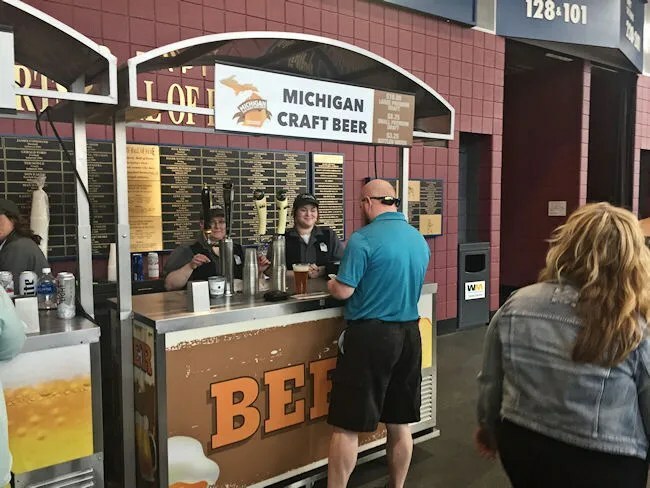 The house carries Budweiser products at their main stands, but they do have some Michigan craft beer sprinkled throughout the arena. There was a stand near our seats that had Bell’s, Founders, and a couple of others on tap…..but beers were $8 for a small or $16 for a large. I wasn’t interested in paying that price so no beer for me as we headed to our seats. 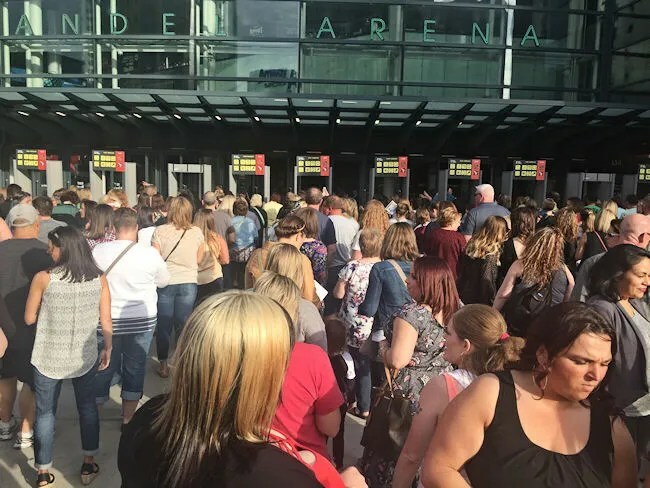 Van Andel Arena holds about 13,000 for concerts depending on stage set-up. 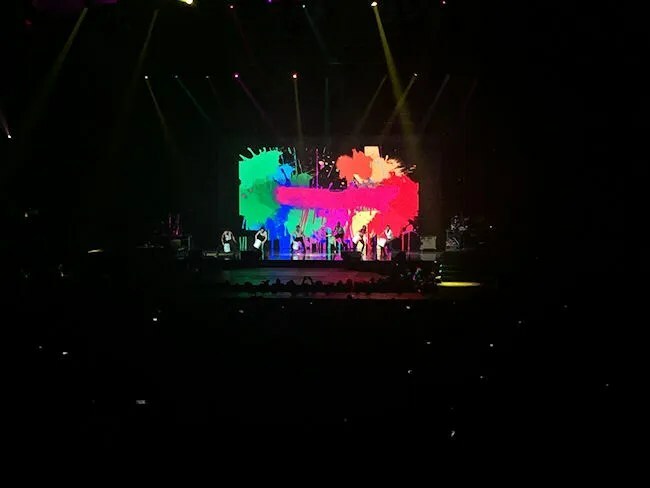 That number was probably lower for this show as they had a large stage with a runway extending out and a separate stage in the back of the arena, so there was a good chunk of the floor that was taken away with the extra stage pieces. Our seats were in the lower bowl section straight back from the stage. We were as far away as we could be, but sitting head on to the stage. It made things a little more comfortable since we didn’t have to sit sideways in our seats. I’m not a big get up and dance person at concerts. I’ll sing a long and sway a little bit, but I really make use of my seat…especially during the openers. Here’s another thing you won’t hear me say often. The seats are actually fairly comfortable. Due to some poor life choices (mostly a Pepsi addiction that won’t quite), I’m not a skinny guy. The seats at Van Andel, while not La-Z-Boy comfortable are wider than seats at many other venues I’ve been to recently. So. Should we talk about the show? I am a child of the 80’s/90’s. I was born in 1979, so I was all in to pop music at the end of the 1980’s and beginning of the 1990’s. This is a concert I would have given almost anything to go to 25 years ago. I wasn’t quite as excited about the bands in 2017, but it was still a really good show and what a trip down memory lane….also, crap…..now I know how my dad feels going to the casinos and seeing Donny and Marie..or whatever concert it is they’ve gone to recently. The opening act was Boyz II Men and yup, I had all of their albums in the early 90’s. Boys II Men was THE group for the junior high dances. I remember getting rejected every time “I’ll Make Love To You” was played in our junior high multi-purpose room. 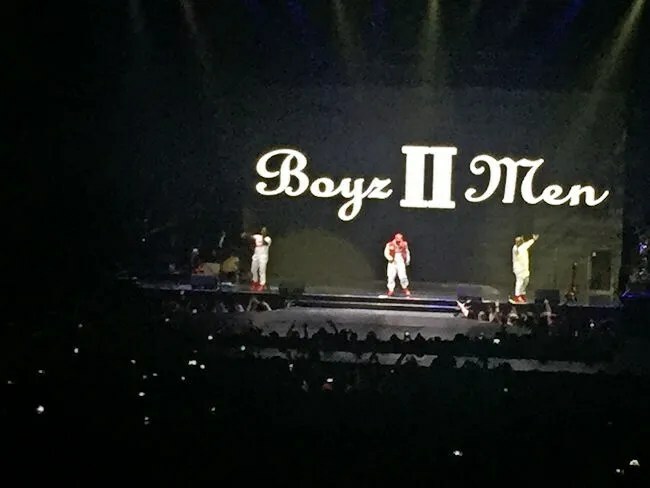 The group is now a trio instead of a quartet due to an illness that took Michael McCrary’s life after he left the group in 2003. They still sounded as amazing as they did the first time I heard “End of the Road”….which always brings back memories of being in a friend’s basement as this song played and all the girls cried because we were at a going away party for one of our classmates who was moving away. Their set was about 45 minutes long and I surprised myself by still being able to sing along with 90% of the songs they sang. Next up was Paula Abdul. This was more of a performance piece than a concert. She clearly wasn’t singing. The songs were way to clear and when she turned on her mic to talk, her voice was muffled and the mic was popping. That’s OK though because it was still a very entertaining show. Paula is a dancer and she showed it on stage doing an interactive show with the video screen behind her and her dancers. The thing that surprised me the most was how many songs she had as hits that I forgot about. They did “Opposites Attract” second and I thought the show was over. The set lasted a little over a half hour. Alright…so let’s just get this out of the way. I was really in to New Kids on the Block when I was in grade school. They were my Beatles. They were my Justin Beiber. Hangin’ Tough came out in 1988 when I was in 3rd grade. I used to watch MTV religiously after school. I would sit there with my VCR remote and try to identify a video in the first couple of seconds before the graphic popped up on the screen with the title so I get hit record. It was the song “Hangin’ Tough” that made me a New Kids fan. Heck, I even talked my parents in to getting me a “Homeboy” shirt printed up and letting me cut up a pair of my jeans….you remember this look….right? I’m not proud of that….aw hell…YES I AM! I wish I still had that shirt….I bet my mom does somewhere. At least I never grew the awful rat tail he had in that video…probably because my dad wouldn’t let me. Anyway, we’re all much older now. 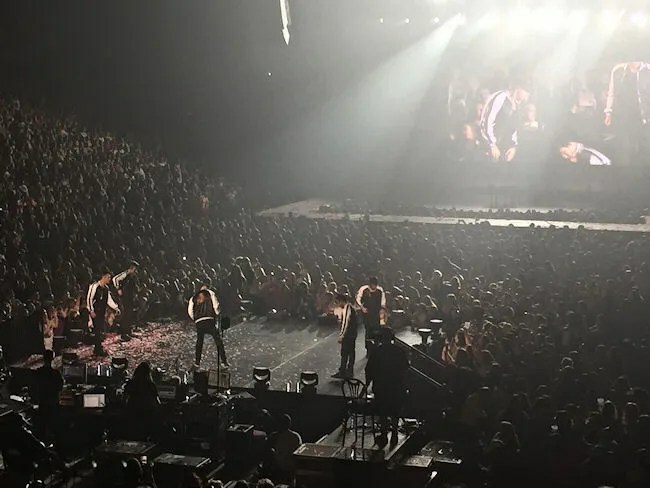 The lady sitting next to me with a beer in each hand apologized in advance for acting like she was 12 again….and while all of NKOTB look better than I ever have or will, they’re still not the teenagers we all fell in love with….and neither is their music. They spent the first hour and a half of their show playing mostly newer stuff that I had never heard of. Their style has drastically changed from the boy band pop music I grew up with to something that is more of an R&B Pop hybrid. I didn’t know any of the music but actually enjoyed the performance. The one song they did sneak in their that I knew was “The Right Stuff.” Other than that, everything was new to me. I mentioned earlier they had two stages. The second stage was much smaller and near the back of the arena which just happened to be right in front of where we were sitting. At one point, Donny looks like he’s crowd surfing but he’s actually being carried by bodyguards to the back stage. While we were all watching him, the other four kind of snuck out and were standing on the hockey dasher boards throughout the arena. Eventually, they all made their way to that back stage and did a few more songs. Touching moment that I couldn’t snap a picture of, Joey McIntyre was the last one to the stage and on his way, he noticed a lady in a wheelchair sitting near the aisle. He actually stopped and you could see him asking who she was with and asked them to take a picture of the two of them before he headed up to join the rest of the group. 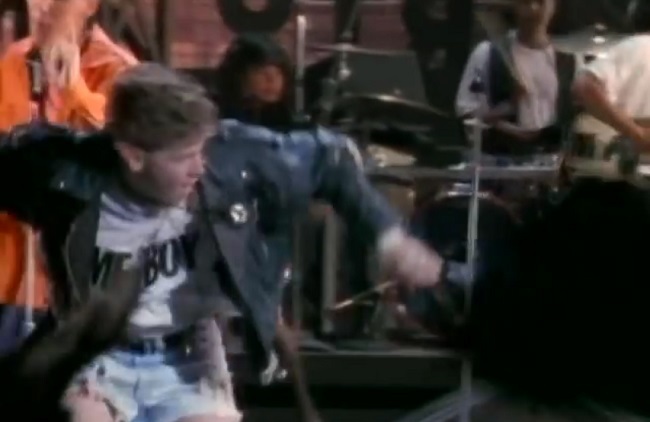 Just before they hit the two hour mark, Joey made his way back to the back stage by himself and belted out “Please Don’t Go Girl.” This marked the point where they started making fun of themselves a little bit and switched from their newer stuff to the classic New Kids on the Block. Once Joey was done, they all headed backstage and gave the crowd a little peep show on the video monitors as they changed into all denim outfits…..including Donnie wearing an all denim what is apparently being called a RompHim. They went through all of their early records singing parts of some of the lesser known songs before bringing out the big guns starting with Step-By-Step. 37 year old me enjoyed this show a lot more than 37 year old me thought he would but not nearly as much as 10 year old me would have. I was a little shocked that I was able to stay in to the show not knowing any of the songs, but even though I don’t have a school girl crush on any of the guys, this is still a band that defined part of my childhood and those memories of all the stupid things I did (the Hangin’ Tough dance at school dances) and all the fights I had with my parents (“But Donnie can wear his cut up jeans without long underwear underneath them!”). 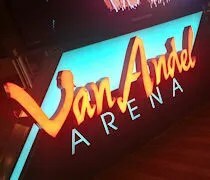 As for Van Andel, it really is a great mid-sized venue. I’ve watched a lot of hockey there and I always love it. It helps that the Griffins have been really good lately, but it’s such a great downtown venue. If you know your way around, there’s a lot of parking within a few blocks and even though the concourses seem small, they never seem all that crowded. I wish Kalamazoo had a venue like this, but I don’t think we ever will. I will still support shows and events at Wings, but when the big shows come close, we’ll be making trips back to Grand Rapids. Funny you mention Bloomington, because that arena has had financial problems, they’ve had trouble keeping a sports tenant there, and they’ve threatened closing the arena down several times to just cut their losses because trying to lure enough concerts and other events has proven difficult. Bloomington is a big example why Kalamazoo needs to keep Wings going as-is. Kalamazoo is just not Toledo or Grand Rapids. It’s hard to support an arena like that if you’re not half a million people in metro size. And with Van Andel nearby, a new arena is still going to have fierce competition from it because of Van Andel’s capacity. Van Andel is a nice concert venue. 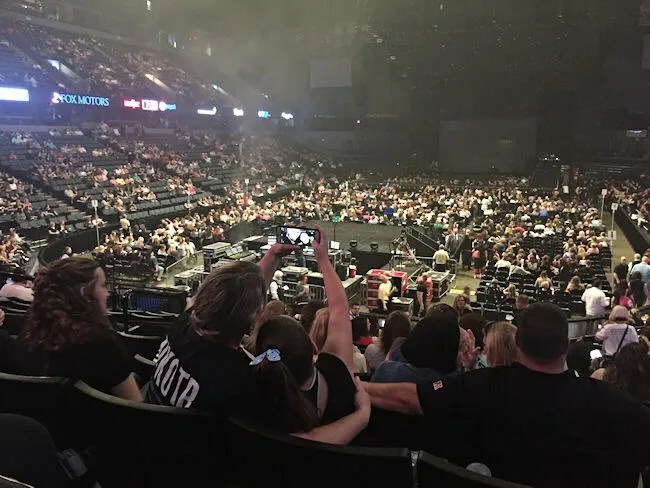 We saw NKOTB there a few years ago when they rolled through with TLC and Nelly, and my wife was there at the show this time with one of our daughters and a friend. And I’ve seen the Griffins there several times now. The best thing is if you can park in the lot right on the back side of arena between it and the highway. Easy in, easy out. Bloomington/Normal also has Red Bird Arena….ISU isn’t moving into the Coliseum any time soon. 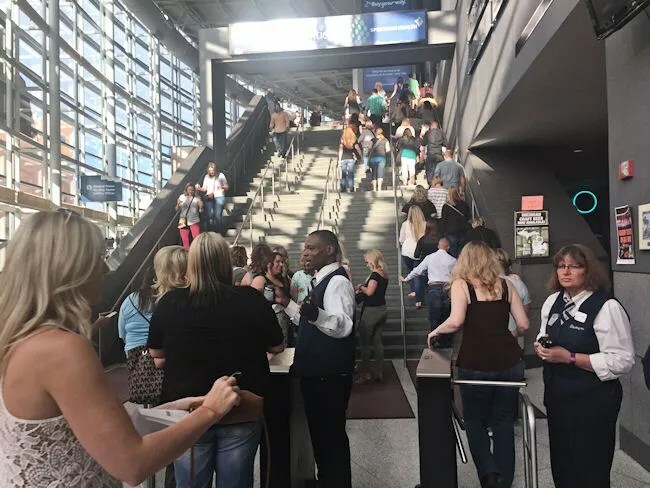 University Arena could stand to be replaced….then you also have their main tenant, the Prairie Thunder, playing in a league no one cares about. The K-Wings are, for now, in a league affiliated with NHL…..but this is an argument we could have all day. I’m always a supporter of downtown venues….and like I mentioned in the post, I know I’m in the minority on this issue.